Data about your health and that of your community can empower you to make — or demand — changes. When there are gaps in the record or the data don’t exist, participatory data collection empowers people to contribute to the public conversation. Access to data is access to power. On November 17-19, 2017, Data for Black Lives will host their inaugural conference at MIT, centering data as an instrument of accountability, protest, and collective action. My friend Max Clermont will moderate a session entitled, “Code Black: Closing the Health Equity Gap,” and invited me to join a distinguished panel that will include Selwyn Rogers, Cheryl Dorsey, and Paulah Wheeler. The distribution of health and disease is not random. Health disparities between Blacks and whites run deep, no matter the age or ailment. Here are the facts: Blacks have a higher mortality rate than any other racial or ethnic group for eight of the top 10 causes of death. African-American adults are nearly 50% more likely to be obese than their white counterparts. And Blacks are six times more likely than whites to be victims of intentional violence. This breakout session will explore the representation, access, and care delivery gaps in our health system. It will also examine the role that racism, poverty, and the lack of opportunity play in perpetuating disparities. In preparation for the discussion, I have been thinking about how data has played a role in empowering the individuals and communities I’ve observed. As a researcher, I tracked how people documented their health and the health of loved ones, participating in the collection of personal data. I also tracked disparities in technology adoption and use. As CTO at HHS, I oversaw initiatives to open up access to data on an individual level, such as through the Blue Button on FHIR project, and at the population level, such as the data sets posted on HealthData.gov. Researchers analyzed government data and found that in New Jersey neighborhoods with a significant share (27% or higher) of black residents, all children—regardless of race—are at higher risk for asthma. ProPublica leverages publicly available (and FOIA’d) data to create tools that people can use to look up doctors, hospitals, nursing homes, and other health care facilities. For example, their Dollars for Doctors analysis of Medicare data shows that where a hospital is located and who owns it make a big difference in what share of its doctors take industry payments. The 2016 National Survey of Children’s Health found that 38% of of children in every state have had at least one Adverse Childhood Experience or ACE, which puts them at increased risk for health problems later in life. Two-thirds of black children (64%) have had a traumatic experience, compared with about 40% of white children and 51% of Latino children. A 2015 Pew Research Center study found few differences among whites, blacks, and Latinos when it comes to tech device use. AIR Louisville is a community program that uses “smart” connected inhalers to help map – and improve – the asthma problem in Louisville. Streetwyze is a mobile mapping platform that enables real-time, community-generated data to be integrated with predictive analytics so that health care providers, hospitals, and cities can track health equity indicators, improve service delivery, and predict future trajectories for vulnerable populations. See, for example, their collaboration with Aclima on air quality. If you have other examples to share — or questions you would like to see addressed — please comment below. 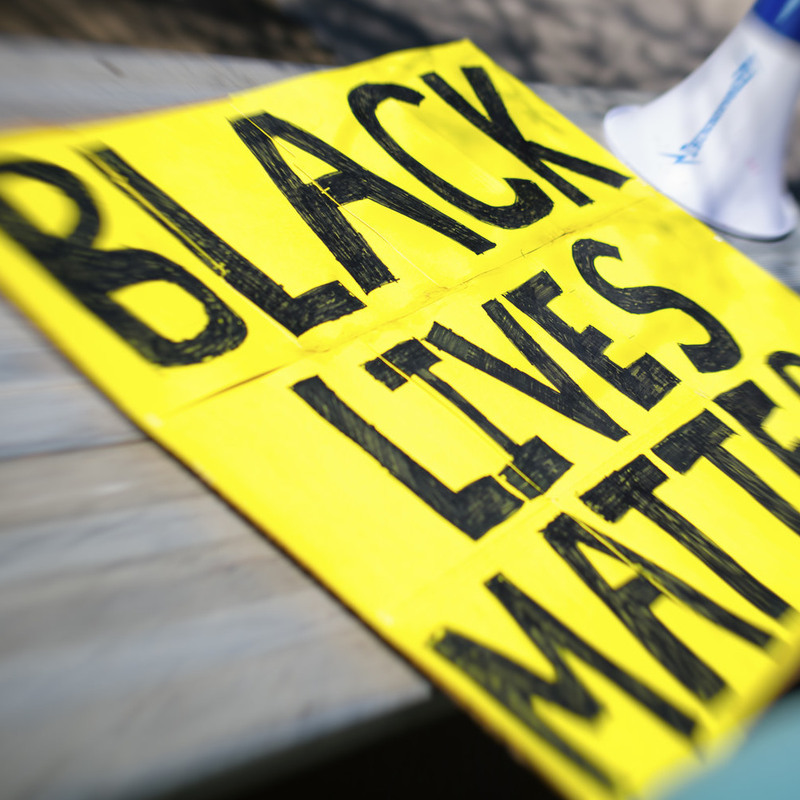 Featured image: Black Lives Matter by Johnny Silvercloud on Flickr. Seeing this post on the heels of reading the interview with Nikhil Wagle of Dana-Farber is quite stunning. I met Nikhil during Susan G. Komen’s Big Data 4 Breast Cancer event in Menlo Park where I spoke about Maureen, her passing, breast cancer and its connection to my work on CLOUD. Thanks for making the jump from Twitter, Gary! I’m grateful to learn about this interview with Dr. Wagle. First thanks for the link to the article about children and asthma in NJ. Before I looked at the charts in the article I guessed the counties were I thought those rates were higher. Except for the zip codes outside AC I was pretty close. My choices based on lower income and more heavy industry. I had not thought about the impact of living by large highways. I look forward to hearing more about your panel experience. Thanks, Dee! The chat summary is a fantastic way to capture insights and ideas that are tweeted and might otherwise disappear. Much appreciated! Knowledge is power. Data therefore is power. Removing access to data is removing power. The longer I live (especially in the medical system), the more I see how true this is. For those who haven’t seen the definition of empowerment I use, it’s at the start of this 5 minute “slidecast” video: dave.pt/empoweredengaged. In short, empowerment is increasing someone’s ability to take effective action … and keeping us apart from our data DECREASES that ability, and is thus bluntly and clearly disempowering. One of my favorite open data sources is SafeCity — a crowdsourcing platform for sexual assault, which was started in India, but anyone can post. Dave, Ranit, thanks so much for adding those resources! Please keep adding resources, tools, and insights to the comments here and on Twitter. I’m grateful for the help as we prepare for the Data for Black Lives event in November! This is more than an “oops” moment. This is serious. Our data represent us. With a poorly understood and poorly diagnosed disease, the Registry’s failure to count some demographic groups has real consequences. — We don’t know how many cases of ALS are not diagnosed before people die. Saying that ALS is white guys’ disease can be a self-fulfilling assertion. How many doctors miss the ALS diagnosis in people of color? After all, the CDC said it was mostly white guys’ disease. — Good epidemiological data should inform science and priorities. Misleading data are perhaps steering precious research funds down some wrong paths. — Finally, the CDC brags of its Registry’s old-fashioned emailing system to inform some people with ALS of some clinical trials. Now we know it actually contributes to the problem of lack of diversity in trial participation. Every person with ALS counts. We must stop the madness of publishing data that suggest that all people with ALS look like the incomplete subset of people that the CDC’s ALS Registry found. This should be the end of the CDC’s ALS Registry. An algorithm, process, and reporting that systematically discriminate are just wrong. Thanks, Cathy, for the follow up! Thanks for bringing up an important topic, Susannah. Last night on the news there was coverage of my local police department’s new implicit-bias training program. Perhaps we need something similar for all who are engaged in information sciences related to healthcare. Cathy, got a link to video of that news item?? What can Black millennial healthcare providers do to increase minority clinical trial enrollment? 1. Enhance the quality of online information about clinical trials. 2. Connect potential participants to satisfied participants and trustworthy providers. 3. Start in our own communities. I’ll be listening for more information & action items along these lines when I attend the PCORI annual meeting. It kicks off on Oct. 31 with a keynote by Freddie White-Johnson, Founder and President of the Fannie Lou Hamer Cancer Foundation and Program Director for the Mississippi Network for Cancer Control and Prevention at The University of Southern Mississippi. The panel that will follow includes Bishop Simon Gordon, whose ministry includes outreach and partnership in health care research. I’ll be blogging about this panel, too, so stay tuned! Thank you Susannah for anchoring this discussion. Practical lessons from ongoing projects remain hard to share; this is important. I’ll add this bit, a very interesting project analysis called “Lessons Learned from an Experiment in Infrastructuring” by Gwen Ottinger about the “Meaning from Monitoring” project. I appreciate this hands-on report about challenge of engaging communities in the design and use of activist tools – the complexity is much higher than it looks from a distance. Worth reading! Here’s the agenda so you can see who is speaking and on what topics. (Unfortunately the 2018 agenda is no longer online.) The opening keynote by Ruha Benjamin was one of the best speeches I’ve seen in the past few years – a must-watch. This part of the conversation reminded me of Alexandra Drane’s work on the “Unmentionables” of health & health care — all the stuff that deeply affects our health (but nobody wants to talk about in public). Stress, caregiving, sleep, money problems, sexual health, substance abuse, adverse childhood events…and the list goes on. The questions we got from the audience sparked more ideas than we had time to express. The one that sticks with me was, essentially: How might data scientists contribute to the conversation about universal health care and make access more equitable? And does access to health insurance make a difference in life expectancy? Selwyn Rogers said, essentially, no, access to health insurance does not, by itself, extend people’s lives. He went on to talk about the social sphere, underlining some points he’d made earlier about how your zip code affects your life span. Researchers found that people who got access to health insurance for one to two years had higher rates of health care utilization; lower rates of financial strain; lower rates of depression; and no change in physical health. I pointed out that we’d been talking about the “smog” of stress and racism that hangs over black communities — a phrase introduced by Ruha Benjamin — and health insurance is one way to remove some of the smog from people’s lives. Update: registration for the 2019 Data for Black Lives conference is now open. If you’re interested in learning more about the inaugural conference, check out the D4BL press page.